The success of Venice's Abbot Kinney Pier convinced Alexander Fraser, Kinney's old partner, to build a rival amusement pier in nearby Ocean Park. He formed the Fraser Million Dollar Pier Company with the intent to build the world's largest amusement pier. His pier would be 300 feet wide, incorporate the existing Horseshoe Pier at Pier and Marine Streets, and extend 1000 feet into the ocean. The pier alone, without the buildings and concessions, would cost $175,000. He awarded the contract on July 29, 1910 and construction started in September. Fraser, who was impressed with Santa Monica's new concrete municipal pier, decided on reinforced concrete piles, too. Construction took longer, because the piles had to be jetted hydraulically into the sandy sea bottom, but the pier was expected to withstand winter storms better. By spring work on the pier was nearly finished as the last pile was in place on May 19th. To complete the pier's Dance Hall, revolving cafe, theater and other buildings in time for the announced May 30th opening, Fraser increased his work force from 350 to 600 men. His payroll approached $10,000 per week. Meanwhile the L. A. Thompson Company, who had acquired the property south of the pier, was building the Dragon Gorge Scenic Railroad parallel to Ocean Front Walk. The immense building took up several blocks and contained several attractions like the Grotto Cafe, House of Mystery and the Auto Maze. The Looff family built an ornate carousel in the Hippodrome building between the Dragon Gorge and the Casino. The Grand Canyon Science Railroad on the pier was one of the first attractions to open. The $100,000 ride had an electric third rail to power the four car trains around curves and up steep inclines. A motorman controlled the car's speed. Apparently the builder wasn't satisfied with the attraction, because he closed it for extensive renovation only one month after it opened. The high speed trains made the ride too short. He added 2000 feet of additional track, put in nine more dips and a scenic tunnel. The improved ride was nearly a mile in length. 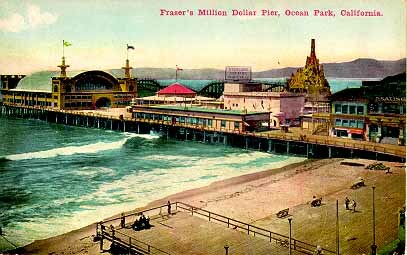 Fraser's "Million Dollar Pier" officially opened the weekend of June 17, 1911. Although many concessions weren't ready, workers took down the scaffolding and applied finishing touches. The evening dedication was in his Dance Hall which featured an elliptical 125 x 185 foot dance hall. Tens of thousands attended the two day gala event. They danced in the huge pier ballroom, watched vaudeville at the 1000 seat Starland Theater, or visited the pier's many rides, shows and exhibits. There was a Crooked House with secret passages to explore, a City Jail to escape from and the Society Whirl. The Third Degree displayed a collection of paraphernalia used in secret society initiations while visitors were transported through the exhibit on moving sidewalks. One of the more interesting exhibits was the Infant Incubators which showed the latest in medical technology. Premature infants received free care by trained nurses in an era when it wasn't readily available at hospitals. Additional attractions debuted later that summer and into the fall season. Another hippodrome opened on the pier opposite the Dance Hall. It featured an ornate Philadelphia Toboggan Company carousel. The Mystic Maze and Panama Canal exhibit also found space on the pier. 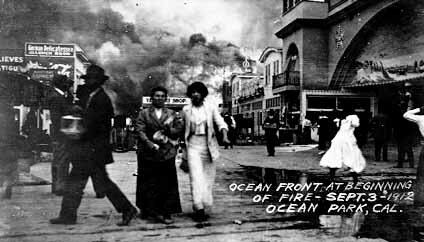 Fire broke out on Fraser's Million Dollar Pier in Ocean Park on September 3, 1912, only fifteen months after it was built. Diners first noticed smoke in the Casino restaurant as flames from the kitchen erupted through the roof. The fire had started in the Japanese servant's quarters located in its basement. Someone had carelessly tossed a smoldering cigarette in some bedding. A strong late afternoon breeze fanned the flames. Sparks leapt two hundred feet high and fell like a fiery bath over the flimsy painted canvas and light wooden grill work that adorned the pier's attractions. Within minutes cries of "Fire!" were sounded from a dozen different directions. 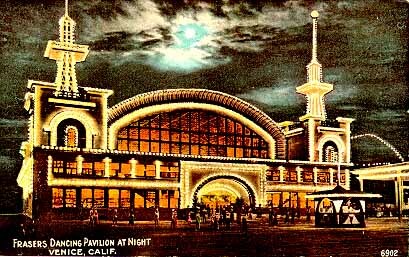 More than a thousand visitors, a hundred couples at the Dance Hall alone, were still on the pier and heading for the two main exits when the Skating Rink across from the Casino caught fire and blocked one of the exits. The first firemen to arrive were only able to aim a few puny streams of water on the fire until Venice's high pressure system was used. The prompt arrival of Los Angeles' fire companies in only 27 minutes did little to contain the blaze. Those trapped on the pier were panic stricken. Some, including Fraser and his young son managed to reach the pier's docks and escaped by boat. Others leapt into the sea. One courageous policeman risked almost certain death to rescue two trapped little girls. He and the girls plunged to safety through a sheet of flames, but he was badly burned on his face and hands. Flames quickly spread north to the Dragon Gorge amusements and burned the uninsured $200,000 structure within a few minutes as 100,000 spectators watched. The fire then crossed Ocean Front Walk and set fire to the buildings facing the pier. Building tenants retreated as the fire advanced, each carrying as much of their personal valuables to safety. The fire relentlessly consumed the entire five city block business district all the way to Trolley Way. Seven hundred fire fighters from twelve fire companies were powerless to stop it. Dynamite was set in a plan to create a fire break when the wind slackened and then shifted seaward at 8:30 P.M. The danger was over and the fire was contained after three hours and thirty five minutes. 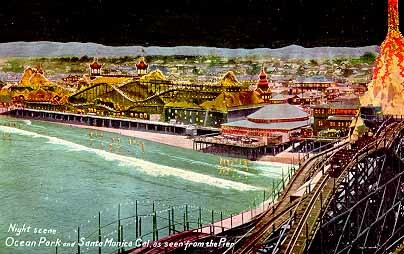 The fire totally destroyed the pier, all the amusements and five square blocks of the business district. In all 225 structures burned, two people died, several were missing, 75 people were injured and 800 people were homeless. The loss was set at $2,000,000 with little of it insured.